See that big white billboard? That thing is on the top of a building that sits across the street from Fenway Park, on the other side of the green monster. Last night, Blue Jays slugger Edwin Encarnacion nailed that billboard with a home run ball. Yes, people hit home runs over the monster all the time, but this was impressive simply because of how damn hard Encarnacion hit that ball. 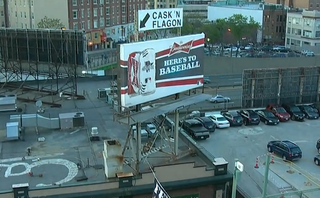 Also, he gets bonus points for making it look like he hit the ball right to where the arrow on the "Cask 'N Flagon" sign was pointing.